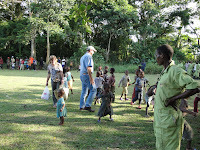 Updates from the field of the Okapi Conservation Project, located in Epulu, Democratic Republic of Congo, Africa. The Okapi Conservation Project is located within the Ituri Forest, in the Democratic Republic of Congo, the most biologically diverse country in Africa. Support the Okapi Conservation Project! 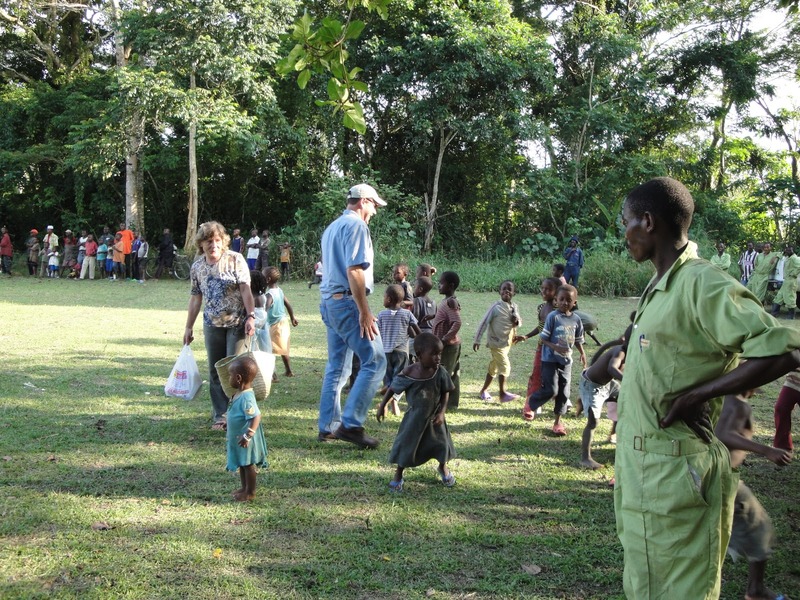 Director Steve Shurter visited the Okapi Wildlife Reserve in Epulu earlier this month. These are his thoughts about the trip. Travel to the DR Congo is hard. There is no way around it, six flights and five layovers from Jacksonville, Florida, and some 11,000 miles and 34 hours later you arrive in Epulu. And the planes seem to get smaller as you get closer, finally landing on a grass strip in Epulu in a small Cessna 206 with four seats and full of luggage. 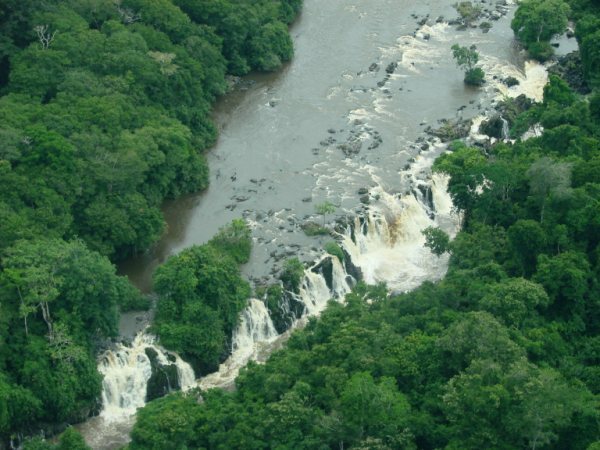 It is exhilarating to skim across the tree tops and rivers and certainly the best vantage point to really comprehend how vast the Okapi Wildlife Reserve truly is. Always a little nerve wracking knowing there isn’t any place to make an emergency landing in all those trees, so you simply have to trust in your pilot and enjoy the scenery.There is often a good turn-out of local kids when a plane arrives, which adds to the excitement of arrival, and the park rangers have to chase the kids to keep them away from the plane and out of harm’s way. It is really nice to have a reception and Rosmarie and Marcel and Eleme came up to greet the plane this trip. We brought along a film crew on this trip to document our work and programs and talk with our team and partners. My first visit to Epulu was in 1985 as a keeper with Miami Metrozoo, so each trip back is always full of memories. Fond memories of people I’ve met and worked with there, and sad memories for people we’ve lost over the years. 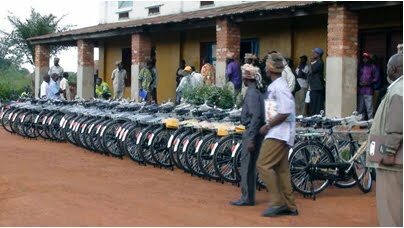 Life in Epulu is challenging. The DRC is not an easy place to live due to poor infrastructure, civil unrest, tropical diseases, and high cost of living. Running the Okapi Conservation Project can also be a challenge, to care for all the workers and deal with the various problems that arise, all the while working to conserve that big, beautiful patch of forest. I lived in Epulu for 1.5 years at the beginning of the Project and I still relish working there and visiting, but I'm thankful to call Florida and White Oak home. It takes a lot of strength and perseverance to live and work in the DR Congo now. Imagine living somewhere where there is no electricity, no running water, no mail delivery, no cell phones, and no hospitals, banks, grocery stores, or pharmacies nearby? Rosmarie Ruf is the Swiss woman who runs the Okapi Conservation Project based in Epulu and has lived there for over twenty years. Some people might think this would be a romantic lifestyle but I challenge anyone who lives in the US or Europe to consider the implications and realities the “simplistic lifestyle” implies. Rosie thrives on the environment in Epulu and the Okapi Conservation Project has developed a bit of infrastructure to enable her to be comfortable and safe and to accomplish the work at hand. An added plus is the community of Congolese workers and Mbuti pygmies who look to Rosie almost as a parent – her extended Epulu family! The Green Living Project (GLP) film team, led by Rob Holmes, travels around the world helping small projects to document their work. Rob is particularly good at interviewing people to capture their passion and ideas and thoughts on their work and their daily challenges for their projects. We spent four days filming in Epulu with the GLP team, interviewing everyone who would speak to us about their work. Of course we filmed the okapi and the pygmies too, always a joy! Time in Epulu takes on specific clarity, probably due to the lack of phone, television or car traffic distractions, your daily interactions and experiences seem clearer. Hornbills and parrots flying through giant trees that scrape the sky are reminders that you are somewhere special, but even conversations with friends or coworkers seem clearer, more poignant. Life is strikingly fragile in the DR Congo and the daily pieces are therefore so much more vibrant. I wish more people could have the chance to experience that simplicity and purpose. In addition to filming I did have the chance to talk with Rosmarie and Marcel about their work. They have a lot of projects on their plate just now, building two new ranger houses at the Zunguluka guard post with USFWS funds, helping ICCN train new rangers to control elephant poaching in the Okapi Wildlife Reserve, and working with UNESCO to manage immigration into the region. They are really good at their jobs and understand the work at hand, so a visit from me serves simply to encourage their positive efforts and lets them know that people around the world truly do care about Epulu and the Okapi Wildlife Reserve. This visit was pretty short, owing to the objectives of the film project, and the travel in reverse was no shorter. But the many plane rides back gave me an incredible bird’s eye view of Africa, from the seemingly infinite Ituri Forest, to the shores of Lake Victoria, past the craggy peaks of Mt. Kenya, then north along the Nile River through Ethiopia and Sudan and over the sands dunes of Egypt to the Mediterranean. A reflection of Africa with not a cloud in the sky that day . . .
We will be working with Rob and the Green Living Project team over the next months to develop the Okapi Conservation Project film, for release sometime this summer. I’m really hopeful that this film enables us to share the Okapi Conservation Project with our friends and supporters and to portray a small piece of life in Epulu and the Okapi Wildlife Reserve. Stay tuned! The Okapi Conservation Project's Fall Update is now available online. Visit our website or click this link to read about the OCP's happenings! During the last 3 years, the Okapi Conservation Project has been working to empower local people in the Ituri region and is internationally recognized for our efforts. The Project’s work focuses on training and providing more than 62 women with knitting and sewing material, improving community agriculture, supporting soccer teams and providing educational tours for the group at the okapi breeding facility in Epulu. Embroidery produced by the women has been distributed to orphans in the towns of Mambasa, Niania and Wamba. Vegetables were grown and distributed among association members and more than 10 women are able to make a living today from tailoring. 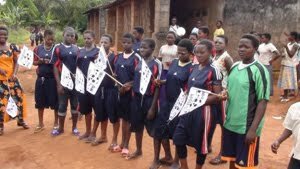 The Okapi Conservation Project women’s soccer team won tournaments in Niania and Mambasa and women are able to disseminate conservation messages during the soccer matches. The photos below speak for themselves. The Okapi Conservation Project education team is focusing on the developing community conservation committees in the northern sector of the Okapi Wildlife Reserve. The towns of Wamba and Mungbere are difficult to reach because of the extremely poor road system, however these communities are critically important to the future of the Reserve because many of the inhabitants there rely on the forest for their livelihoods. 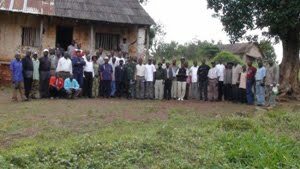 The education team, along with the Institute in Congo for the Conservation of Nature (ICCN) rangers, encouraged customary chiefs and local government administrators to become involved with formal community conservation committees. The committee members are tasked with communicating with their communities about the Okapi Wildlife Reserve conservation objectives. 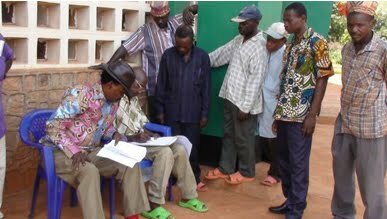 They are provided with resources such as information booklets and flyers, and technical support in areas such as agro-forestry and school rehabilitation, as well as bicycles and basic office supplies to help them travel and distribute information throughout their constituencies. This program is financed by a grant from UNESCO in support of the Okapi Wildlife Reserve World Heritage Site. 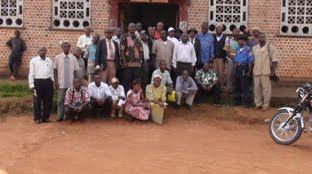 Five conservation committees were initiated in Wamba (57 participants) and Mungbere (28 participants) in 2010. The education team’s recent mission was to conduct an evaluation of the effectiveness of the conservation committees. Three of the committees had done a good job of internal organization, rehabilitating school infrastructure and agricultural tasks and will now also focus on curbing illegal activities associated with the Okapi Wildlife Reserve. Leadership problems with the other 2 committees were resolved and efforts will now be focused on getting them up to speed. The committees suggested they would like regular contacts with ICCN leadership to help their progress and to conduct special lobbying with military official based nearby in the city of Isiro to help solve poaching problems. A joint mission with the Okapi Conservation Project Education team and the Community Conservation Unit of Institute in Congo for the Conservation of Nature (ICCN) recently traveled to the North of the Okapi Wildlife Reserve. They held meetings with Wamba and Watsa Territory officials, police, army, customary leaders, school directors and church leaders. Girls and boys were selected from all secondary schools to participate in soccer competitions related to the events. 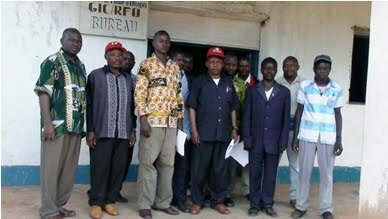 The intent of the meetings included: recognition of ICCN as public instituti on involved with conservation in the region; participants support for ICCN anti-poaching campaigns; acceptance of local customary leaders to participate in joint public awareness missions; establishment of an ICCN guard base camp near Wamba; and need for collaboration with the court in Isiro to punish arrested poachers according to conservation laws. In recent years the Okapi Conservation Project education team has been working in the northern region of the Okapi Wildlife Reserve under challenging environments, including very difficult travel conditions on poor roads. This mission is a great success for the future integrity of the Okapi Wildlife Reserve, establishing critical lines of communication, collaboration and cooperation.